Installed to provide convenient access through automatic operation and enhanced security, garage door openers also protect from accidents. Since 1993, all openers are manufactured with safety sensors, which can prevent a door from closing down on people or object standing in the door's path. They also have an emergency release rope, advanced and powerful motors, and a backup battery. They work either with a remote control or keypad, might have motion detection lighting and some of them can be operated through smartphones from miles away. They are necessary parts for any automatic system, and require regular maintenance. They are small devices which are installed at the two parts of the door jamb. They must be mounted 4 to 6 inches above the floor so that the beam they project will be interrupted even if a pet passes under the descending door. In this case, the sensors send a signal to the opener to stop and reverse the movement of the door and so accidents are avoided. This is the rope hanging from the carriage. When it is pulled down, the door opens and closes manually. The rope can be useful during emergencies and when someone is entrapped during a power outage for example. The carriage is another name given to the garage door trolley, which is connected to the door-arm. When the cord is pulled, the arm disengages the opener. 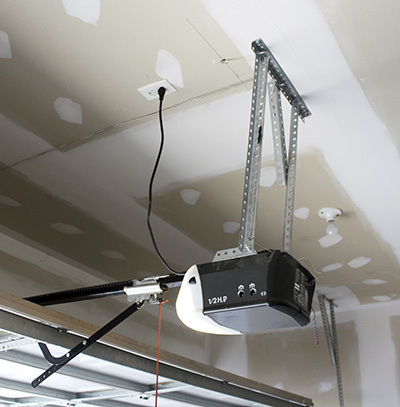 Direct Current garage door motors are more advanced than Alternating Current ones. They immediately switch to battery operation when the power is out, are quicker and faster. Since they are smaller, the size of opener units is smaller too and doesn't occupy too much space. There are two ways you can ensure your opener works properly. Besides proper opener installation, the entire electric system must be maintained often and repaired when issues pop. Our professionals at Garage Door Repair New Port Richey offer full opener services. 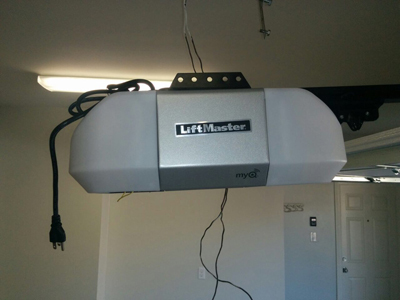 Garage door opener maintenance includes photo eyes cleaning, inspections, lubrication and adjustments. The reverse system, travel limit and force of the door should all be checked and tested. By placing a flat board on the floor when the door is coming down, you check whether it reverses back upon contact. By grabbing the bottom part of the door on its way down, you check its force. If it doesn't stop, the force settings must be adjusted. There are up and down switches on the opener box which determine how far up and down the door will go. They must be adjusted so that the door will open and close fully. Any problem should be reported to our company. The door should reverse when its closing movement is obstructed by an object. If it fails to stop and go back up, let us know. Our technicians offer emergency garage door repair and will be with you as fast as humanly possible. Call us for questions and service.